Erin Beeston is just completing her PhD by studying the development of Liverpool Road station and the nearby Campfield area, showing the effect each had on the other. She shared some of her insights with us so, once again, Marple History is at the cutting edge of historical research. 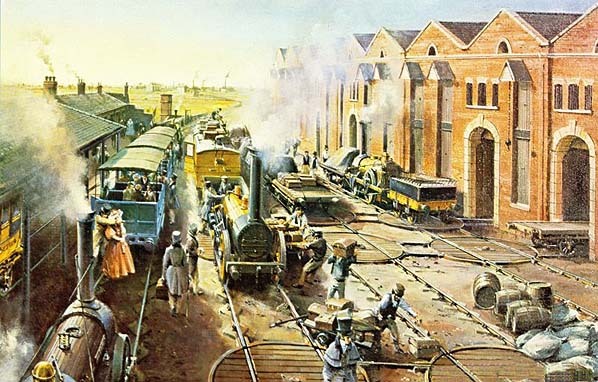 At first the railway carried both freight and passengers; Fanny Kemble, the actress, wrote about her “magical experience.” It soon began to concentrate on freight and the single warehouse built in 1830 proved so successful that two further warehouses were built. When the company was tak en over by the London & North Western Railway and Victoria Station was opened in 1844 all passenger traffic ceased and it was turned into a goods yard. As the railways expanded the slums were demolished but Campfield remained a very working class area. In 1840 the Owenite Co-operative movement built the Hall of Science (right) as a centre for working class education and social activity. Opened by Robert Owen himself, the building cost £7,000 and was the largest lecture hall in Manchester, holding over 3,000 people. Because of its radical activities it attracted opposition and an attempt was made to burn it down without success. It hosted Chartist meetings and various debates including ones in which Friedrich Engels participated but splits in the Owenite movement meant it was not fully used so by 1850 it was sold and the Manchester Free Library was established. It served a diverse range of the local population for a generation but by 1875 it was decided that it was an inconvenient location and the weight of books had in any case weakened the building. 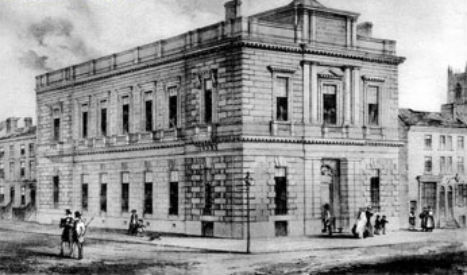 The library moved to the former Manchester Town Hall on King Street and the hall was demolished. Despite its slightly off-centre location the area continued its diverse development. Although the slums were gradually disappearing it retained a sizeable resident population. The railway bought additional land in 1854 and the Knott Mill Fair (left) was an important part of social life. 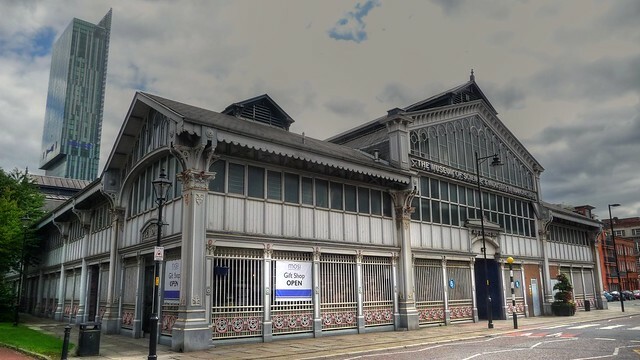 However, the city regarded it as a rowdy and badly run fair so it took the opportunity when the library moved, to demolish the old hall and erect new market halls, between 1878 and 1882. From the start these were controversial; other wholesale markets accused them of diverting trade, and they never really found a permanent role. Designed by the same architectural firm responsible for the Watts warehouse (now Britannia Hotel) on Portland Street, they have been used in a variety of capacities. Markets, trading floors, exhibition centres, a barrage balloon factory. More recently an artisan’s market, a theatre and a wedding venue. The future for one of the halls (below) seemed secure when the Museum of Science and Industry leased it for an Air and Space Gallery. However, that too is being reviewed as the building needs much work and is hugely expensive to heat. It seems wrong that such beautiful buildings at the heart of a mixed area historic cannot find a permanent use. The future of Campfield lies in its past. The area was the centre of key developments in the history of the industrial revolution - the first canal, the first railway, the first girder bridge and a focus for major social changes. We can only hope that this heritage will be conserved and built upon. Erin’s research has provided a good base to build upon.